There was once a time when I used to wait the whole year for Christmas so that parents would take me candy shopping. I am now four decades older, yet the child within me craves for sweet edibles once in a while. Luckily, growing old doesn’t necessarily have to mean growing up. And for as long as I have the best CBD gummies, the child inside of me will always stay alive. Hey everyone, its Aaron here, and today I’m about to review some products that are very close to my heart. In case you didn’t figure out yet – I’m talking about CBD gummies, a form of edibles that give you the benefits of cannabidiol with a punch of sweet candy. But I’m not the only one who likes these in my household; my daughter, Kim, craves for them too. What are our favorite products? We’ll tell you everything, but before that let’s give you new CBD users a glimpse into what gummies mean. CBD gummies are a type of edible that contains the essence of cannabidiol and promise to give you results similar to CBD oils. They are 100% THC free, meaning they are non-psychoactive and fit to be consumed by everyone. Gummies consist of hemp oil along with other essential ingredients like CBN, CBG, terpenes. Note: CBD gummies are not the same as marijuana gummies as the latter contains THC. CBD gummies are legal in all 50 states of the US due to their non-psychoactive properties. Now, coming to the real question, “why should you use CBD gummies?” Well, similar to other products like CBD oil and isolates, gummies also have beneficial properties. Though not as potent as isolates and CBD oil, gummies can help you deal with stress, anxiety, and tension. Think of it as somewhat of a “non-serious” approach to health issues. Look, you don’t need to have a reason to try CBD gummies. You can do so simply because they are delicious. Having a sweet tooth myself, I can’t tell you how much I am in love with these. You’ve heard of Fab CBD, right? Might be through Facebook? The company that everyone is talking about? Well, you’ll be glad to know that their edibles are as fabulous as the more raw, CBD oil. 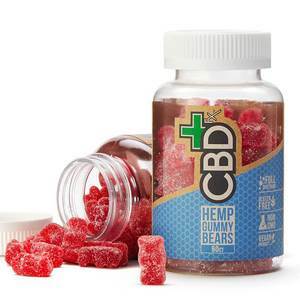 This is probably my most favorite CBD gummies of all time, though the company doesn’t actually call the products gummies – but refers to as chew. Perfect when you use it as a work time snack or when you’re on the go. There is no official dosage mentioned, so I’m going to say that you should take no more than 1-3 at a time. Don’t get me wrong; I didn’t mean to say eating more than chews will bring any harm. Just that it’s best to start off slow and observe how the CBD reacts. The reason why Fab CBD ranks #1 on my list is that of how it worked on my daughter. There’s nothing wrong with her, but she does get very agitated (read: excited) at times. Giving these sweet, tasty, chews not only helped her calm down and do her homework but also promoted me to the ranks of “Best Daddy in the World.” As for me, I just loved munching on a few of these daily and allowed the sense of relaxation to take control of my body. 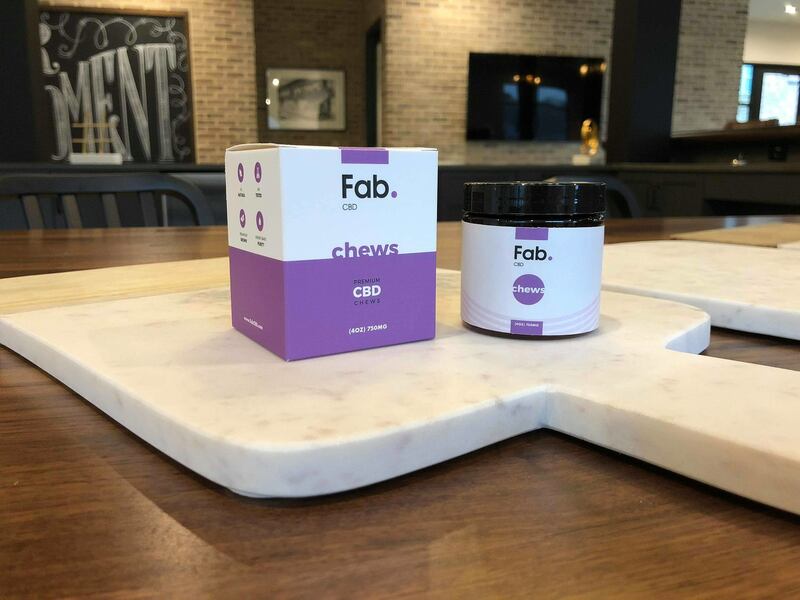 If you happen to be someone who likes to meditate, I bet the Fab CBD Chews will help you get to the state of ‘Zen’ faster. You honestly have no reason to skip this one out. If you’re looking for an effortless way to include CBD in your lifestyle, you can perhaps do no better than Hempbombs Gummies. These tasty little treats not only delight your taste buds but also provide a host of health benefits. Better sleep, relief from pain, reduced stress, and an overall healthy lifestyle are the things you can expect from this product. Don’t believe me? Check out the features and then decide. Each piece of gummy contains 15 mg of organic CBD, so eating two pieces would mean ingesting 30 MG of CBD. Start with the lowest number i.e. one gummy (15 MG) and see how it goes. If you don’t feel any effects, feel free to increase the count. Hemp bombs rank number 2 when it comes to many products, but their gummy is exceptionally brilliant. Whereas other brands put much of their focus on taste and on the presupposed “fun factor,” this company claims that this product has helped benefits! Yup, you heard that right. These high potency gummies might not be as effective as CBD oil or capsule for that matter, but you can still use it to get a better night’s sleep. And maybe perhaps even treat anxiety and mild pain. My daughter and I both love it, for different reasons of course, but the benefits we reap are almost identical and in plenty. 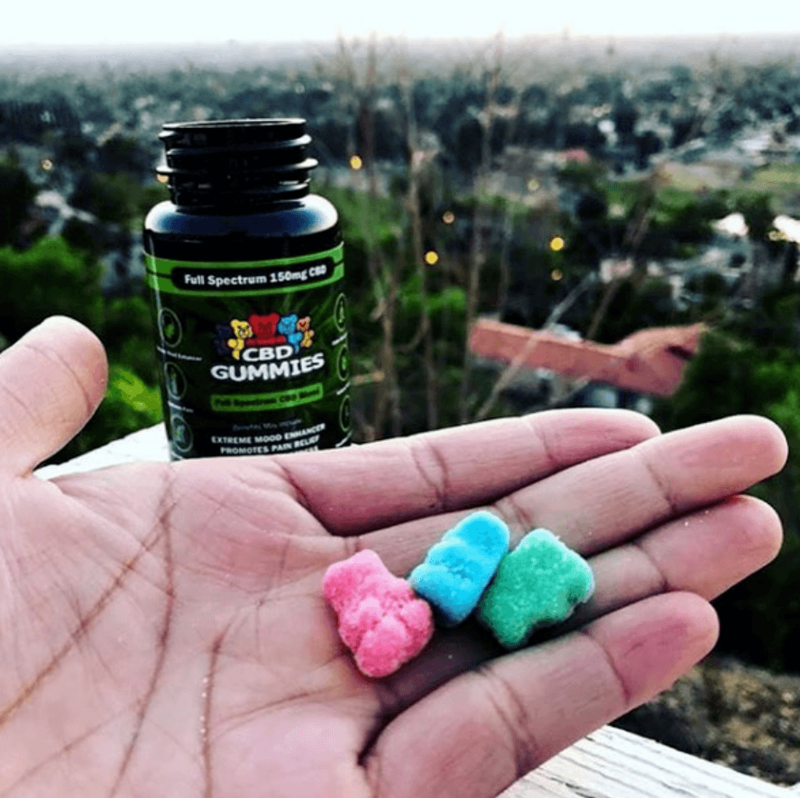 You might not get the best deal out of Hempbombs Gummies if your expectations are too high. I recommend just using these to chill out and see how everything goes. Arguably One of the most reputable brands in the industry today, CBDFx has some of the finest tasting Gummies on the market. These edibles are made from all natural ingredients and contain food-grade CBD hemp oil. My daughter loves the flavors, and I occasionally steal a few from her to satiate my own sweet cravings (don’t judge me lol). No Corn Syrup, No Animal Gelatin, No Artificial Sweeteners. There’s nothing such as ideal dosage. Eat 2 a day and see what satisfy you. To be frank, I didn’t buy these with the intention of treating my back pain or anxiety; I did it just because I thought CBD candies would be fun. Now, I normally don’t advocate for flavors in CBD stuff, but gummies are exceptions. After all, what’s the point of having a candy if it doesn’t appeal to your taste buds? Kim is a fan of these. She eats 2-3 per sitting and As for as effects are concerned, I’d say edibles do a good job in managing stress and anxiety. I used to take CBDFx Gummies every night before going to bed, and I slept like a baby. Oh, yes! If you have a thing for candies and want the goodness of CBD, then, by all means, go ahead. You can share it with your kids as well; I’m sure they’ll like it. “Paradise in a bag” is how the company describes their tropical gummies, and I’m not going to be the one to disagree. What separates gummies by Koi CBD from others is how they make them. Unlike other companies who spray on the CBD oil, Koi uses a 3-Step plan to ensure that the CBD gets evenly distributed throughout each gummy. Check out the product features to know more. Adults can take the gummies up to 1-3 times a day. However, the company recommends that first-timers wait at least 3 hours to see how the CBD kicks in. I swear to give my daughter Koi CBD Tropical Gummies was the biggest mistake I ever made! She wouldn’t try any other candy because she took such a liking to it. Of course, I don’t blame her because these gummies are that good. What does daddy have to say? Well, I believe that it can help you manage stress and anxiety as well. So, don’t count on the taste to be the only selling point. I once went on a trip, depending on nothing but these gummies to help me get through the day. And I’m glad to say that these edibles proved their point. If not anything, then I can guarantee that you’ll sleep better at night when you start taking these gummies. 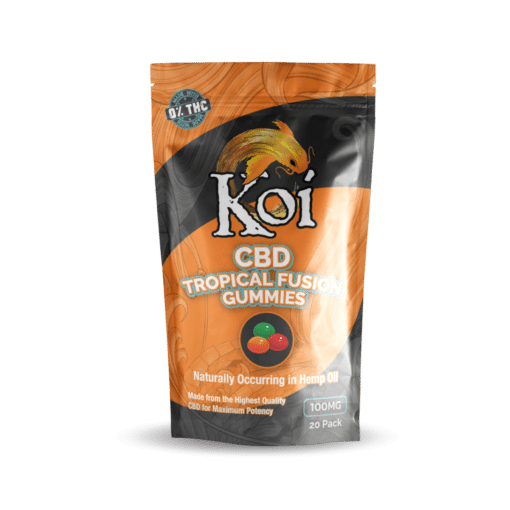 Once you get a taste of Koi CBD Tropical Gummies, I bet you’ll go “Hmm… Where were these all my life?” Get ready for an explosion of flavors inside of your mouth every time you bite into this product. CBDistillery is one of the premium brands today making a wide assortment of CBD products. Their dedication to maintaining quality shows in every item you buy, including the edibles that include gummies, candies. To be honest, just visiting the Edibles section on their website makes me feel very happy as they are my favorite brand after all. They recently launched the gummies. They launch a product, I try it and write about it. One of the best tasting. I take 2-3 gummies once before sleeping that’s it. Overwhelming. I started off with CBD gummies. They did what they should and I enjoyed them thoroughly. My daughter would make you believe that they are the best thing in the world. She just loves those attractive shapes that gummies come in. How does daddy enjoy them? Well, I sometimes you walk into my office sucking on these gummies without anyone batting an eye. Never knew your favorite CBD dude, Aaron could be so daring, did you? YES! You must try them out. Period. Now, my experience with gummies for anxiety has been a lot different than using gummies for pain. I’ve always had a positive effect with these edibles because CBD has an inherent trait of calming the nerves – in other words, alleviating stress. So, I felt anxiety symptoms also reduce when the levels of stress became low after consuming CBD gummies. Can you expect the same? I frankly don’t know. That’s because CBD has different effects on different bodies and it’s tough to tell how it will hit you, or not hit you at all. I take these chewy treats because I love them, and so does my daughter. Think of the munch time as a sort of bonding ritual between me and my little girl. Yes, gummies are safe, and you can give them to children. As far as the effects are concerned, I’m incredibly grateful that these products help me keep calm. Just a couple before leaving for office is enough to get me throughout the day without having a mental breakdown. And not to mention how relaxed I feel as soon as I reach my cubicle. Much like capsules, you can use CBD gummies as a “stealth” form of treatment. It’s not that you need to hide anything; sometimes, just being able to do what you want without taking questions from others is liberating. As hard as it might be for anyone to believe, I did buy my first pack of CBD gummies expecting it to cure my back pain. If not heal, then at least keep the pain under control when I am not taking CBD oil. After all, CBD can get expensive. However, it didn’t take long for my hopes to get dashed because those products didn’t do anything. A friend of mine said, “Aaron, you doof, you don’t take Gummies to help you with curing back pain; you take it for the taste.” I must admit I felt like a fool because what I heard did make sense. Many months later when I had casually shifted to another brand of CBD and was trying out their gummies, a sudden revelation arrived. It was astonishing! I never thought I would get this feeling before. Suddenly my bouts of back pain seemed to have lessened, and I was no longer taking any CBD Capsule or Oil. It was the CBD gummies that did the trick! So, was I misled all this time? Not really. I discovered that only very few brands make gummies potent enough to cure an ailment. While my back pain didn’t go away completely (I don’t expect it to), for a very long time I enjoyed sucking on those delicious candies while enjoying all the benefits that come with CBD intake. So, what’s the product I’m talking about here? FAB CBD is the real MVP that took care of my back pain problems day in and day out. I like them. But I like them because I don’t expect gummies to treat my anxiety or back pain instantly. If you go in with low expectations, I’m sure you’ll enjoy the flavor of these edibles. Allow the products stress-busting properties to come in as a bonus instead. You can also share these with the kids in place of regular candy for some added health benefits. I certainly got rid of my guilt of indulging in sweets after switching to CBD gummies; you’ll probably feel the same way. Go ahead and order online and have them delivered right to your home. But as always, don’t forget to do your own due diligence before buying.